It's the letter from school I never expected, and it was worth the wait. The "head lice is going around school" letter. The "a stomach flu is going around school" letter. The "no candy is allowed and all food for the Halloween party must be nut-free" letter. The "head lice is going around school" letter again. The "no candy is allowed and all food for the Valentine's Day party must be nut-free" letter. The "birthday party invitations cannot be distributed at school" letter. The "snow gear/rain gear dress code for recess" letter. The "step throat is going around school" letter. The "head lice is going around school" letter yet again. The "here are all of the places parents are not allowed to park at school" letter. The "make sure your child gets a good night of sleep before the PARCC state assessment" letter. The "a case of the Epstein-Barr Virus has been diagnosed in your child's classroom" letter. I'm afraid to check my email! What's next? Asbestos in the pipes? The bubonic plague? I get it. Parents need to be informed. Teachers want sick kids to stay home. No one wants to endanger a kid with a food allergy. Kids need to wear boots on the playground. The parking lot is small. Testing is important. My kids go to a great school in an excellent school district. They're getting a solid education. I check their homework daily, and I occasionally see quiz scores, art projects, and writing samples. Their grades are fine, their classmates are friendly, and their teachers are accessible. The saying "no news is good news" should be applicable here. I have nothing to complain about, yet I long to receive a letter from school about something positive. About the curriculum, technology in the classrooms, or character education. About how our kids are handling Common Core. About anything other than nits and vomit! Then a postcard arrived in the mail. It was addressed directly to my first grader. 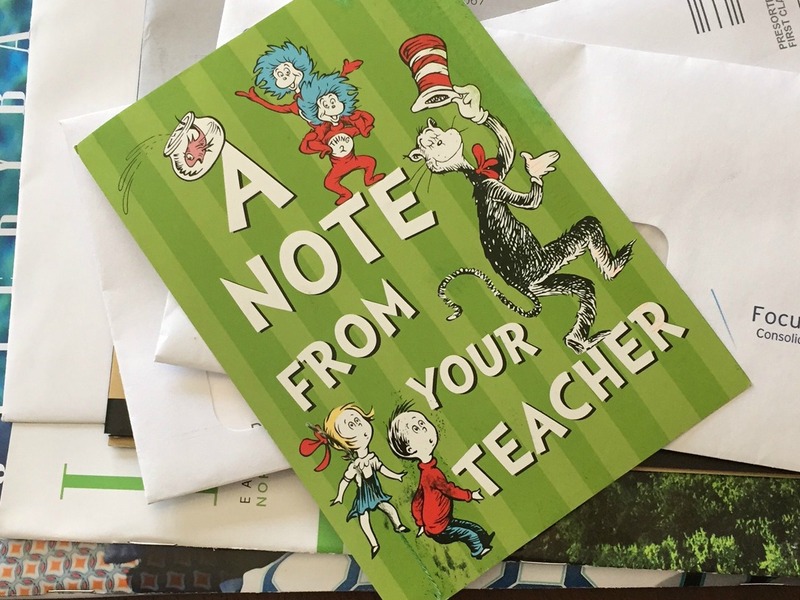 The front was bright green with images of well-known Dr. Seuss characters, and the back had a handwritten note from his teacher with phrases like "proud of all your hard work" and "fantastic reader and writer" and "great friend and helper" and "Keep it up!" I left it in the mailbox so my son could discover it on his own after school. A huge smile stretched across his face when he found it, and I couldn't have been more proud as I listened to him confidently read it aloud.